It is state of the art to define relationships of noise indicators for environmental noise with annoyance and other harmful effects (e.g., sleep disturbance, cardiovascular, and metabolic effects).,,,, Well-defined noise indicators are proposed by the European Noise Directive 2002/49/EC. Various exposure–effect relationships have been found by field surveys. These relationships are fitted curves linking noise indicators as Lden or Lnight to various effects such as the percentage of individuals annoyed, sleep disturbed, or with other specific health effects. Due to the different field studies used for input data and also the various individuals involved, any exposure–effect relationship is linked to a confidence interval around the curve fit. These exposure–effect relationships, including their intrinsic immanent confidence intervals, have been the basis for recommendations on threshold levels for the protection of public health., Such threshold levels can also be integrated into national law for noise protection. Threshold levels for action planning or as legal limits can be used to enforce noise protection measures or to decide on the environmental impact of planned traffic infrastructure. They are used for planning new roads, railroads, or airports, or to adjust and prioritize the noise control for already existing infrastructure. Such limits are primarily intended to avoid exceeding a defined percentage of persons annoyed or sleep disturbed by noise of the traffic infrastructure and finally keep people healthy. Although it is clear that the effects have been analyzed from large field studies and can’t be extrapolated directly for a given local situation, it is the most pragmatic and transparent way to allow for decisions in a legal framework. To predict annoyance and other health effects for field studies and environment impact analysis, the noise indicators are calculated using prediction models. It is important that these calculations are not valid to determine a noise pressure level at a certain moment in time, but for a noise indicator, which is for example the Lden or Lnight. These are long-term average sound levels determined over all the periods of a year, and where a year is a relevant average year in terms of emission and sound propagation conditions. These average values take varying situations into account such as traffic data, road or railroad characteristics, aircraft emissions, wind turbine operations, and noise propagation conditions. Receiver points are by definition located at the facades of relevant buildings. They are based on long-term average input parameters such as the sound emission for the vehicle or aircraft fleet, the characterization of road pavement or railway design, the relevant sound propagation condition due to meteorology, and many other items. The uncertainty of the calculated noise indicators is dependent on the quality of input parameters and sound propagation models. According to the Guide to the Expression of Uncertainty in Measurement, these uncertainties can be classified into type A uncertainties known from repeated measurements or type B uncertainties based on expert estimations. A random component, usually underlying a normal distribution, has to be considered for noise indicator values used in field studies. In addition, systematic effects (offsets) could also occur by using different computation algorithms, different definition of parameters, or different assessment of input parameters which result in systematic under- or overestimation of an input parameter. Furthermore, the allocation of noise-exposed individuals to a certain exposure is a further cause of uncertainties. These two kinds of effects are not within the scope of this analysis. This paper theoretically analyses the impact of random uncertainties on the observed exposure–effect relationship. For illustration of this impact, published exposure–effect relationships are used to simulate the effect of uncertainties on an exposure–effect relationship which would have been determined under field study conditions. The analysis should show how sensitive exposure–effect curves are to the uncertainties in noise-level determination. It should further clarify if safety margins are needed if annoyance or any other health effects have to be predicted based on such curves. The aim is to illustrate the effects in case of different exposure–effect relationships which can be used to determine legal noise limits. Four different exposure–effect relationships are used to illustrate the effect of uncertainties. The first example is a hypothetical simple linear relationship as shown in Equation (1). In this general formula, and also for all the following examples, %E should be the effect, which could be, for example, percent highly annoyed (%HA), percent highly sleep disturbed (%HSD), or any other measurable effect (e.g., health effects). The level L is any kind of noise indicator, such as Lden or Lnight. For this specific example of a linear relationship, k is the slope and d is the offset. The second example is a polynomial fit third order of the form as demonstrated in Equation (2). The third example is similar to Equation (2), but a polynomial fit of the order of two as shown in Equation (3) is used. Such an equation has been used to describe the relationship of self-reported sleep disturbance and Lnight. In this paper, the constants (C = 20.8, ka = −1.05, kb = 0.01486) are related to the relation of %HSD and Lnight as described in Reference . The fourth studied type is following Equation (4) which is similar to a logistic regression curve, which is often used in noise effect studies for binary variables. Such an expression has been proposed for the community tolerance level (CTL) concept for exposure–effect regression. K is a constant value of (5.306 dB −LCT), where LCT is the CTL. In the example of this study, LCT was assumed to be 78.3 dB, which is taken from the average value for road traffic noise in Schomer et al. To simulate the effect of uncertainties, the following algorithm was designed with MatLab (The Mathworks, Natick, Massachusetts, USA). For each value of L, from 1 to 100 dB in steps of 1 dB, a sampling procedure was performed. A total of 105 individuals were assumed to be exposed to that value of L. This sample size is appropriate to calculate later new effect curves without relevant statistical fluctuations. It is comparable to a field study, where 105 persons are observed at each 1-dB bin from 1 to 100 dB. Now, because of the random uncertainties to be simulated, the real-value L_true was calculated based on a normal distribution with a standard uncertainty of σ = 1, 2, 5, or 10 dB. So each individual with an assumed exposure level L is simulated to be exposed in reality to a different value L_true around the average L.
Method 2 is calculating as well %E(L_true) for each simulated exposed person but then simulates binary data per observation. It generates a random number from 0% to 100%, and in case the number is below %E(L_true), it counts it as a binary event (e.g., highly annoyed) to derive the observed %E curve. Both methods are similar. However, in the case of method 2, %E can never reach values higher than 100%, whereas method 1 follows the underlying relationship and can therefore reach more than 100%. To illustrate this effect, the initial underlying “true” %E curve is plotted next to simulated “observed” %E curves using both methods 1 and 2. By using 105 samples for each step of 1 dB, no curve fit is needed as the resulting points already follow a curve which is close to a continuous function. Even method 2, which results in principle in a more scattered distribution results in a smooth curve when using such high sample sizes. It is the aim to simulate such a high number to show the systematic effect which remains, even if an infinite number of observations would be used. However, real field studies have substantially lower numbers of observations. As an illustration, another simulation has been performed with only 1000 observations in the dose level range from 45 to 85 dB. Furthermore, there could be smaller uncertainties for higher sound levels (usually closer to the source) in contrast to higher uncertainties for lower sound levels. For this simulation, the uncertainty was continuously decreased from 8 dB at 45 dB to 0 dB at 85 dB. The use of linear exposure–effect relationships is illustrated in [Figure 1]. No difference between the assumed true %E and the observed %E curve, not even for a standard uncertainty of 10 dB is observed. Only minimal fluctuations can be seen at very high zoom levels, which are based on the sampling algorithm and would disappear completely if the sampling size of 105 in each dB bin would be further increased. Only when applying method 2 to calculate the observed curve, can it be seen that it asymptotically follows a bending which doesn’t allow exceeding the 100% level for %E. As illustrated in [Figure 1], a normally distributed uncertainty in plus or minus direction will result in a linear relationship and will not change the mean observed value if the sample size is large enough. The situation becomes different when the underlying function is curved with the order of f″(x) > 0. This is an effect illustrated with the nonlinear curve in [Figure 1] where an asymmetry is caused by the exposure–effect: +x dB results in a higher effect as −x dB results in a lower effect. [Figure 2] illustrates a situation with a standard deviation of 5 dB for a noise indicator and an exposure–effect relationship of the second example for an underlying curve with a third-order polynominal fit. The observed curve is lying above the underlying “true” curve, except for high levels and method 2, where the curve is forced to stay below 100%. The curve shift is 1 dB at the level of 65 dB in this example. If the standard deviation is decreased to 2 dB, this shift is reduced to ∼0.2 dB. In the theoretical case of 10-dB standard deviation, the shift would exceed 3 dB. The situation is similar in case of the third example with a polynomial fit of the order of 2 as illustrated in [Figure 3]. However, due to the less steep characteristic of the underlying true curve, the shift is less compared to the second example with for example 0.5 dB at a level of 65 dB. [Figure 4] finally shows the effect when using the exponential curve as used in the CTL style. At the level of CTL minus the constant (5.306 dB), the “true” curve and the “observed” curve intersect. At the inflection point, f″(x) is 0 and changing from >0 to <0. In the lower exposure region, the observed curve lies above the true curve, as in [Figure 2] and [Figure 3], above the intersection point it lies below. 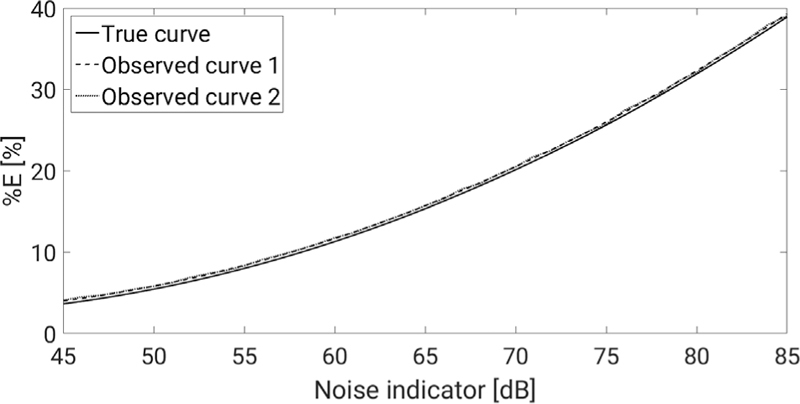 The difference in the lower noise level region is lower compared to the curves in [Figure 2]. At 65 dB, a standard deviation of 5 dB is linked to a curve shift of 0.6 dB. The different impact of the uncertainty standard deviation on the curve is illustrated in [Table 1] for a noise index value of 65 dB. The table shows the shift of the curve on the x-axis in dB or on the y-axis in difference in the percent numbers of highly annoyed or highly sleep disturbed. It has to be emphasized that the results including one decimal are slightly sensitive to the random effect of the simulation and could change by 0.1% or 0.1 dB for repeated simulation runs. [Figure 5] shows a situation as it could be observed in a real field study with only 1000 observations and assuming a third-order polynominal fit according to Equation (2) for the exposure–effect relationship. The observed data at each dose bin is scattered around the true exposure–response curve. An additional curve fit is needed, again using a cubic equation. In this example, the systematic effect is hidden because the random effect is larger due to the smaller number of observations. The observed curve shows a higher number of binary events (e.g., highly annoyed persons) in the lower sound levels, but an underestimation of the real value at higher levels. However, this is only one example for one random simulation. A repeated simulation run would result in a different figure. Only when using the high number of 105 observations per dose bin, can the always present systematic effect be visualized, whereas the random effects are cancelled out. The result of this study shows that even if a field study would have infinite high numbers of observations (105 per dB bin), no uncertainty in the assessment of the effect, but only an uncertainty in assessment of the noise level, nonlinear exposure–effect relationships are different from the true relationships, which would be observed without any uncertainties. The standard deviation for the calculated noise indicator in this study was simulated between 1 and 10 dB. Recently, the uncertainty of calculated noise levels and its influence on exposure–response relationship as determined in a large study has been analyzed in detail. It concluded combined uncertainties between 3 and 5 dB. Although for aircraft noise, the values were almost constant with distance between source and receiver, the uncertainty decreased with increasing distance for road traffic and railway noise. In a paper by Bertsch et al., the uncertainty for LA,max determination for single events of aircraft noise was reported from 2 dB close to the flight track to up to 5 dB and more for exposed persons in larger distances. A very detailed uncertainty analysis by Schäffer et al. showed that whereas uncertainties for the single event are higher, the overall uncertainty of the total noise indicator using radar data as input calculation for existing airports is reduced to 1 dB and less. For sources close to the ground, the prediction scheme ISO 9613-2 includes rough estimates for the transmission calculation uncertainty from 1 dB at high receiver points less than 100 m to the source to 3 dB at larger distances. Especially for wind turbine noise, more detailed data including not only propagation, but also the variance of the sound power, are showing standard deviations for predicted sound pressure levels of 4 dB. However, it was estimated to rise to at least 10 dB standard deviation (SD) for distances of 10 km to the wind turbines. For road and railway traffic noise calculations using the new calculation scheme of European Directive 2015/996, a standard deviation of ∼3 dB can be assumed for the transmission part, based on the underlying calculation scheme. As each input parameter for the emission should not exceed 2 dB, the corresponding standard deviations will be much smaller. A combined uncertainty of 1 to 2 dB for the entire emission part added to the transmission uncertainty will result in an overall combined uncertainty of 3 to 4 dB, which is in the same order of magnitude as reported in the literature references for receivers close to traffic noise sources. Liepert et al. presented the influence of uncertainties on the relationship between %HA persons and level or aircraft noise. Although the inclusion of the uncertainties in the sound calculation increased the confidence interval of the presented linear relationship, it showed only negligible influence on the curve itself. The results of our study are in agreement with these findings. However, for nonlinear relationships, this study concludes a systematic effect on the observed relationships. Due to the large confidence intervals, the effect is dominated by the random effects of limited observations at each level dB in a field study. But even an infinite number of observations will result in an observed curve which is different from the underlying true curve. 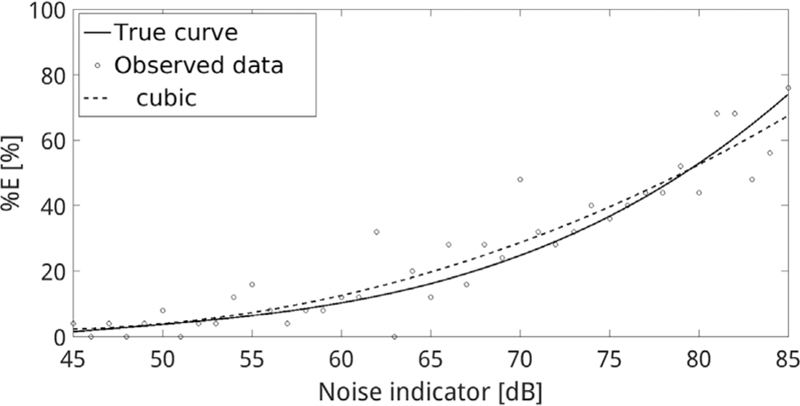 To limit the influence to less than 1 dB shifts of the curve, uncertainties should be kept below 5 dB standard deviation.A common criticism when using predicted noise index values for evaluation of expected health outcomes is that no uncertainties for the assessment of the sound levels themselves are taken into account. It’s often a public request that an uncertainty value has to be calculated for the noise indicator and the threshold has to be lowered by a safety margin of say 2 or 3 standard deviations to reach 95% or 99% confidence level. This would mean that for a standard deviation of just 2 dB the threshold level should be reduced by up to 6 dB. The World Health Organization night noise guideline recommended long-term threshold level for Lnight should then be reduced from 40 dB down to 34 dB. If the confidence level for the studied effect is taken into account as well, additional safety margin dBs would decrease the threshold levels to levels which become useless as they are practically not nonapplicable for designing any form of traffic infrastructure. However, the confidence level resulting from the uncertainty in the noise indicator assessment has not been discussed in detail. The results of this study show that normally distributed uncertainties result in a slight overestimation for the prevalence of harmful effects in field-study dosage–response curves. This should not be used as an argument to increase the threshold levels. However, if the prevalence of effects in a given situation is predicted with noise-level calculations, and the uncertainty in the assessment of the noise indicators is lower or equal to the uncertainty in the underlying field studies, no further safety margin for the noise limit is appropriate. The effect of uncertainties is already intrinsically contained in the published exposure–effect curves and the derived threshold limits. Munzel T, Gori T, Babisch W, Basner M. Cardiovascular effects of environmental noise exposure. Eur Heart J 2014;35:829-36. Basner M, Babisch W, Davis A, Brink M, Clark C, Janssen S et al. Auditory and non-auditory effects of noise on health. Lancet 2013;6736:1-8.
WHO. Night noise guideline for Europe. Copenhagen: World Health Organization, Regional Office for Europe; 2009. European Environment Agency. Good practice guide on noise exposure and potential health effects, EEA technical report No 11. Copenhagen; 2010. doi:10.2800/54080. ISO/IEC Guide 98-3:2008 Uncertainty of measurement—Part 3: Guide to the expression of uncertainty in measurement (GUM: 1995). 2008. Miedema HME. Relationship between exposure to multiple noise sources and noise annoyance. J Acoust Soc Am 2004;116:949-57. Schomer P, Mestre V, Fidell S, Berry B, Gjestland T, Vallet M et al. Role of community tolerance level (CTL) in predicting the prevalence of the annoyance of road and rail noise. J Acoust Soc Am 2012;131:2772-86. Liepert M, Mühlbacher M, Möhler U, Thomann G, Schreckenberg D. Uncertainty of calculated noise levels and its influence on exposure-response-relationship in the NORAH-project. In: 12th ICBEN Congr. Noise as a Public Heal. Probl., Zürich; 2017. pp 1-8. Bertsch L, Schäffer B, Guérin S. Towards an uncertainty analysis for parametric aircraft system noise prediction. In: 12th ICBEN Congr Noise as a Public Heal Probl; 2017. pp 1-12. Schäffer B, Plüss S, Thomann G. Estimating the model-specific uncertainty of aircraft noise calculations. Appl Acoust 2014;84:58-72. ÖNORM. ISO 9613-2: Akustik. Dämpfung des Schalls bei der Ausbreitung im Freien Teil 2: Allgemeines Berechnungsverfahren. Vol. 12. 2008-07-01; 2008. Keith SE, Feder K, Voicescu SA, Soukhovtsev V, Denning A, Tsang J et al. Wind turbine sound pressure level calculations at dwellings. J Acoust Soc Am 2016;139:1436-42. Foy C, David E, Dutilleux G. Comparison of 3 engineering methods for outdoor sound propagation. In: DAGA 2014, Oldenburg; 2014. Kephalopoulos S, Paviotti M, Anfosso-Lédée F, Van Maercke D, Shilton S, Jones N. Advances in the development of common noise assessment methods in Europe: The CNOSSOS-EU framework for strategic environmental noise mapping. Sci Total Environ 2014; 482-3:400-10.